Use for hanging signs, plants, and pictures from suspended and drop ceilings. Hook attaches to metal cross braces between ceiling tiles. 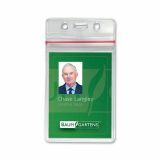 SICURIX Sicurix Sealable Cardholder, Vertical, 2 5/8 x 3 3/4, Clear, 50/Pack - Sealable Card Holders keep ID and security cards dry and secure, sealing tightly but opens easily. Design includes zip enclosures. Each badge holder accepts cards up to 2-5/8" x 3-3/4". Can be used with a lanyard or card reel.